Description Multiple concurrent sections/groups: Each player will be placed in a group, mostly quads (4), with other similarly rated players. The lower section may have more players, depending on the number of entries. This tournament will appeal to both veteran players and also be an ideal tournament experience for newer players since you will be playing people of similar skill. 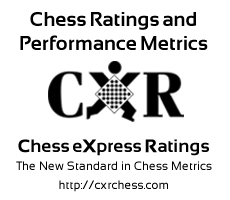 Groupings will be based on CXR/USCF ratings where applicable. $10 Entry Fee; and $10 good-faith deposit that will be returned once you have completed your Round Robin. PRIZES: With lots of sections, about one in 4 will be a winner. Every quad grouping will have first place of $15, plus a gift. The final grouping, if more than four players will have a first of $15 and second of $10 (returned entry fee). All players completing their round robin within the month will get their good-faith deposit back. It is just important in a RR format that people not withdraw, so there is the deposit incentive. With the entire month of March, and total flexibility on when and where, completing your rounds should not be difficult. DEADLINE to join is 2/27/16 at 7p.m. at Sweetbay in Fort Smith, or get your entry to the TD prior to that time. Directions This event is a March Round Robin - players may play their rounds anytime during March, and anywhere they wish. Play at a regular club meeting, or before or after work/school, during lunch, at the library or wherever works for you and your opponent for that round.